EzFaux Décor LLC’s® products have been featured on The Steve Harvey Show, The Rachael Ray Show, HGTV, DIY Network, Showtime’s Homeland and many more. Faux Soapstone Film is much thicker than grandma’s contact Paper and is BUBBLE RESISTANT.Faux Soapstone Film has a peel away backing with measure and grid lines to make it easy for YOU to install. Faux Soapstone Film is manufactured in an ISO 9001 Certified Facility. Faux Granite Film has a transparent top coat for durability and uses a non-toxic water based adhesive. Our adhesive allows Faux Soapstone Film to be repositioned during installation and is removable without residue. Faux Soapstone Film is bubble resistant and it will assists you in creating NEW looks and/or repairing the appearance of ANY existing smooth surfaces. I was very pleased with the product, order/delivery and most of all the substantial cost savings. Excellent overall. 5.0 out of 5 starsGORGEOUS GORGEOUS GORGEOUS! My circa-1980’s kitchen has always been such an eyesore, but (as you know) kitchen remodels are expensive! So, I figured I’d paint my cabinets black and figure something out with the countertop. 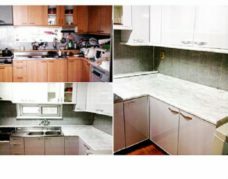 I searched and found a perfect solution for my countertops (or so I thought) – a concrete finish. While I loved the look, I wasn’t willing to trade the time and effort required to get the look. So, I continued my search for a solution and found EzFaux Decor. My biggest issue was, their color choices didn’t really hit what I was looking for. I called the company and asked if they had anything darker than what was shown on their site (at the time). I was ecstatic when she told me she had just finished uploading a new choice – Charcoal Soapstone. She said she’d mail me a sample, but I knew it was what I wanted the moment she told me about it so, I ordered it immediately. I can’t tell you how ecstatic and pleased I am with the result! The picture doesn’t even do it justice! I want to go sit in my kitchen just to look at it – ha! I still have a section above the stove to complete, but I couldn’t wait to send in pictures. My order was delivered but stolen from my porch. Etsy made it good after I filed a police report and is sending me a replacement. Thanks Ezfauxdecor for the prompt and excellent service,. Excellent customer services! When I had questions they were answered quickly and professionally. Thank you! What a transformation! I used these in my rental apartment. It really made a big difference in my kitchen!!! Although the quality of the product is good, it was a full day of applying the product to the countertops. We had a lot of corners which made for a lot of extra time getting the product just right. Once done, it does look close to real soapstone. It serves a purpose when considering cost and the ability to renovate. Surface stays cleaner and looks great. I absolutely love this marble paper it is stunning. The owner of the company was a pleasure to work with and she kept open communication with me about my order since changes to the order had to occur. I am so pleased that I am ordering a second one today! Good product and shipped quickly.